Amazon prepping Kindle 3 for newspapers? Will the next Kindle be more like a broadsheet newspaper? We can probably file this one in our 'Stating the Obvious' category, but let's hear it anyway – Amazon appears to be working on a new Kindle with an even larger screen. 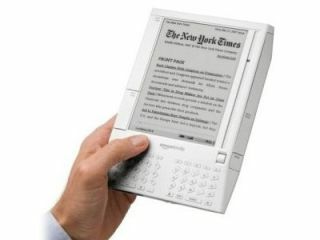 The Wall Street Journal says that the Kindle 3 is likely to launch before the end of this year with a screen comparable in size to an A4 sheet of paper. That would mean Amazon could then target newspaper publishers eager to boost subscriber numbers. After all, what could be simpler than electronic delivery to a wireless e-book reader that almost mimics a paper? Obviously, none if this is even close to confirmed yet, but we can lump it – along with last week's news of the Murdoch e-book – in with all the rumours that are almost certain to come true sooner or later.